"Wow! 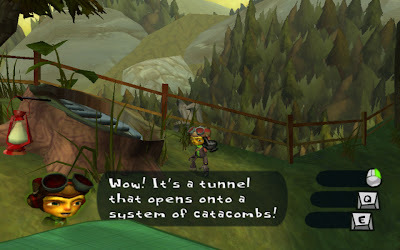 It's a tunnel that opens onto a system of catacombs!" This was a line in the floppy disk version of The Secret of Monkey Island. Guybrush said that exact phrase, and then the game asked the user to insert non-existant floppy disks. Lucasfilm Games reportedly got so many calls on their hint line about the "stump joke", that the joke was removed from the enhanced CD-ROM version of The Secret of Monkey Island.